On the north east side of Kitu Island. Kitu is a small island off the tip of Nuapupu island, near the Mala (#6) and Port Maurelle (#7) anchorages, easily within dinghy distance of both anchorages. Unfortunately, there is no place to secure a dinghy for this dive. It is best done with 2 pairs of divers, and one pair watches the dinghies and the other dives. 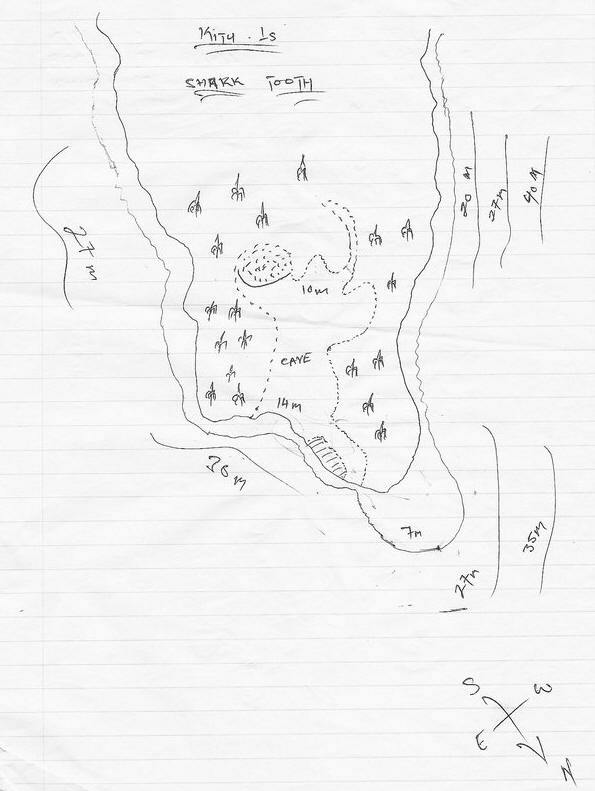 Note that this sketch is oriented with North down. 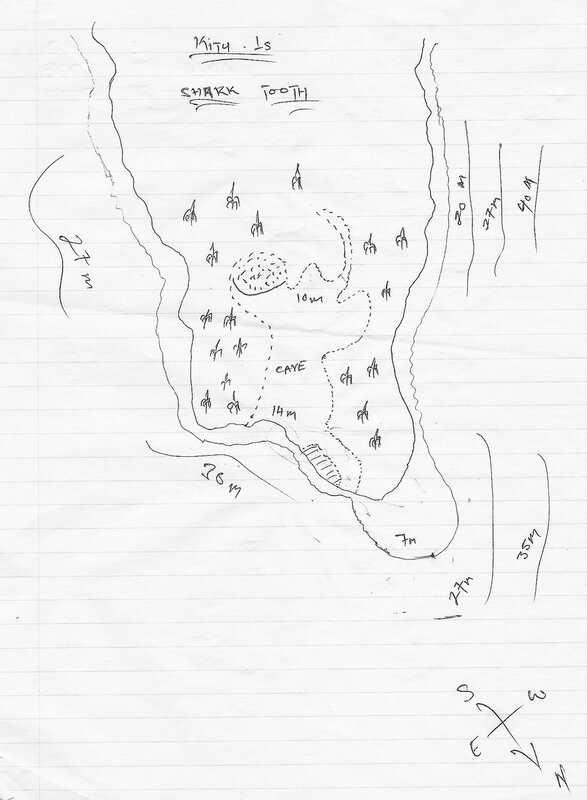 This dive starts at the cave in the sketch. There is usually some current here, unless you are diving at slack tide. So when you get in the water, you need to be ready to descend quickly and enter the cave to get out of the current. The cave bottom is about 40', and it's a fairly large cave. If you want to fully explore the cave, a dive light would be helpful. In the back of the cave, to the left, there is a shelf where some small white-tipped sharks hang out. There is also a small air pocket in the cave, and you can surface, if you like. There are also sometimes sea snakes, but they are shy and disappear if they see dive lights. If you check the dark pockets carefully with a dive light, there are a bunch of very interesting things to see. Moray eels, red pipefish, and a Papuan Scorpionfish. There are also nudibranchs, feather stars, sponges, etc. Exit the cave to your left (north), down and out through one of two arches, and proceed counter-clockwise around the north tip of the island, and down the west side. Outside the cave, there is a nice wall at 40-50' with coral and fish. If you have someone in a dinghy trailing you, you can just proceed on around the island.